This puffy features 240g of toasty synthetic insulation to seal out cold and a water-resistant shell fabric to shield them from the snow and rain. Attached, adjustable storm hood. Shell: 100% polyester Omni-Shield™ Storm-Lite DP II. 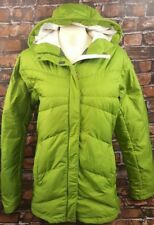 This girls' Elm Ridge puffer jacket from Columbia Sportswear is ideal for use in winter weather. SIze YOUTH XL ( 18/20 ). Lining: recycled polyester, polyester. Machine wash. Long sleeves. FABRIC & CARE. The Columbia powder light puffer is an ultralight, toasty jacket with faux down insulation, a water-shedding shell and tons of style. The powder lite puffer jacket is also treated with water-repellent Omni-shield technology to keep you dry and protected during wet weather. Terrific kid's cold weather coat width, across chest, under arms: 18.25". Length : 29". Sleeve: 26". In good used condition. We are only human and may make a mistake once in a while. Shoulders : 17". Two options in one: this reversible jacket has solid fleece inside and a durable, water-repellent nylon print on the other. top of shoulder to bottom hem: 21-22.5". Water resistant fabric. Faux down insulation. Down Jacket in Raspberry Pink/Purple with down. This lighter weight jacket doesn't weigh much but can keep you warm, dry and protect you from the wind. Size Youth Large. 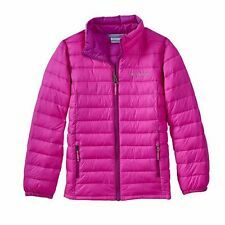 Girls light weight puffer jacket. Columbia Sportswear. Machine wash. Size 14/16. Check out this Super Cute COLUMBIA Girls White Purple Accents Omni-Shield Puffer Jacket! 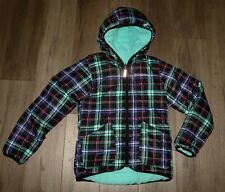 This puffer jacket is comfortable and made to keep your young one warm! Equipped with Omni-Shield, advanced repellency sheds water and wards off stains keeping them dry and protected!